Available since July 11th, 2008, here is the Wine's development release 1.1.1 (the second development version since release of Wine's first stable version), a free implementation of Windows on Unix. - Fixes for Photoshop CS3 and Office 2007 installers. - More progress on gdiplus. - Support for Unicode files in regedit. - Many Richedit fixes and improvements. To download binary packages for several systems and distributions, see HERE. PlayOnLinux is appeared in the press for the fifth time. 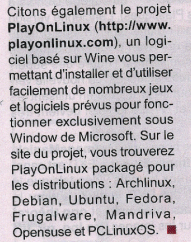 The Planète Linux French magazine wrote a brief about PlayOnLinux version 3's recent release. >> PlayOnLinux, a piece of software that we did present to you in our last issue, is available in version 3. As reminder, this project propose to easily install Windows games on Linux with Wine's help. Your favorite program's 3.0.8 version is arrived. - A lot of confusions are fixed. For example, the repository's update button which was incorrectly named "Program's update"
I think it will be the last version of the 3.0.x.branch. The 3.1 version's development will start soon. We thank "Linux Pratique" for the following article, appeared in their magazine (N° 48) at the seventieth page. Let's mention also the PlayOnLinux project (https://www.playonlinux.com), a Wine based piece of software allowing you to install and easily use numerous games and softwares designed to run exclusively on Microsoft's Windows. On the project's website, you will find PlayOnLinux packaged for the distributions: Archlinux, Debian, Ubuntu, Fedora, Frugalware, Mandriva, Opensuse and PCLinuxOS. What the hell, did we forgot it? I'm ashamed ... very ashamed .... and I'm maybe not the only one ... because we forgot to signal something important! 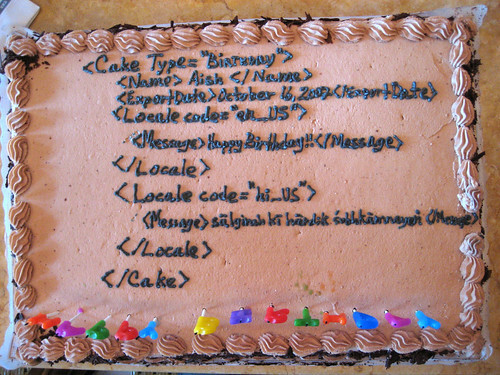 This is the birthday of someone important on the website ... yes! Tinou! Despite our late (for me, it was done the 26th, so 3 days of late!) or the probable ignorance of his birthday's date for someones, we wish him an happy birthday to the big shot big boss Tinou who celebrate his 17 years. Here is a beautiful cake to be forgiven. By the way, we thank him for his exceptional work, he spend a lot of time for this noble cause, and working with him is an honor and a pride. Zoloom runs to hide in order to avoid the divine wraith ... but this news will be removed tomorrow at midnight. A release date for Starcraft II? Who doesn't wait impatiently for the sequel of this best-seller RTS? So this date would be the: 3th of December 2008. It matches with what Blizzard announced, that is to say a release during the end of 2008. Despite it isn't an official date, it would be strange that these 3 online shops would have announce this date by chance. The first development version of Wine after their stable version (1.0) was released 2 two days ago, in the evening. * Many more gdiplus functions implemented. * Many Richedit fixes and improvements. * Support for HWND_MESSAGE windows. * A lot of new MSHTML functions. * Many fixes in MSI registry handling. * Initial implementation of the inetmib1 DLL. * Improvements to the quartz renderers. A number of bugs were fixed, as listed in this page. See you in two weeks for the next development version. This minor version only brings IRC related improvements. Other new thing, independent from the POL's version: there is one channel per language. Therefore, we will only accept English on the #playonlinux channel. We couldn't carry on regardless of a such event: after 15 ans of a fastidious development, Wine's 1.0 version (stable), preceded by 5 Release Candidates, is available. Announced as mature, this version did yet shown that it was able to run almost every Windows application. This version only brings bug fixes to correct the large number of malfunctionings of the older versions. Thus, many applications and games did benefit from tweaks. We congratulate the Wine project and all its contributors who did manage to bring an efficient solution to run our favorite games under Linux. We thank them for their exemplary work. First of all, I want to apologize for this version's delay (note from the translator: I want to apologize too for the translation's delay). Indeed, a version was planned sooner but I did prefer to do everything in the same time in order to propose a satisfying version before the 1.0 version (which shouldn't be released before several months because of the holidays and the improvement's difficulty). So to being forgiven, I propose you a version of POLSC which is, in my opinion, practical and has powerful features. - A script creation assistant able to create every script type very easily (Script that need a download or a CD-ROM for example). It is more beautiful, practical and has an help for each thing asked to the user. Obviously, it's fully compatible with the version 3 of PlayOnLinux. The others functions in the 'Functions' menu will be updated in the v1, all the windows will be re-designed. - After many requests, you can now go to the next text field (only in the assistant) by pressing two times the TAB button. In order to save some time. - The Cancel/Do Again functions work at last. Please note also a more practical text field. - The whole functions use, as the help, MulX's documentation. By the way, I thank him for his work. - Commands are now added at the current place of the cursor. - The "Quit without save?" window is now set to appear only when required. - An update assistant was added. It notifies you if a new version of POLSC is available. For the next version It will propose you to download and install the new version automatically. - For lack of a tabs system, I added a button to remove the current script's content. - Enlarged main windows which was to small according to some users. - The bug with "Save As" which was creating an empty file. That's its for this version. I want to release a 0.5 version, just before the v1 development's beginning. It will only add minor features and fix 0.4 version's bugs. Since this version had required to re-write many lines of code, I invite you to report potential bugs to fix in the 0.5 version. I want to thank MulX for providing a more explicit documentation than mine, Tinou for his numerous ideas, critiques, beta-tests and uploading, and also the whole staff for supporting me and making me happy when I wasn't.